This is the zeroth (introduction) in a series of Tutorials aimed at iPhone developers who want to learn how to port existing applications or create new applications in Windows Phone 7. The series will consist of brief tutorials, with a focus on the minimum you need to know to add Windows Phone 7 development to your skill set. A DirectX 10 capable graphics card with the WDDM 1.1 driver. Windows 7 http://bit.ly/w7Home or Windows Vista. In either case, any edition and both 32bit and 64 bit are fine, but you cannot use the Starter Edition of either for WP7 development. Update: the Windows Phone Developer Tools January 2011 Update is now available. To sell your WP7 applications through the Marketplace, you have only to register, which you can do at http://developer.windowsmobile.com. An incredible amount of work has been put into ensuring not only excellent performance, but smooth animation. I will cover the dual threading that has been implemented, as well as performance tuning, in one of the early tutorials, but the short version is that it is not rocket-science, and by and large you can and should ignore performance tuning until you complete your program. You certainly can write some games in Silverlight, but if you have a high performance game and/or want 3d or you have many assets to manage, you may well prefer to write your game using XNA. That’s fine, because WP7 programs can be written in either. And in any case, whichever you choose for a given application, you can still use classes from the other. Here are some general guidelines to help with understanding the strengths of each of the two platforms (from the Windows Phone 7 Developer Portal). You want a XAML based, event driven application framework. You want a high performance game framework. You want rapid creation of a Rich Internet Application-style user interface. You want rapid creation of multi-screen 2D and 3D games. You want to use Windows Phone controls. You want to manage art assets such as models, meshes, sprites, textures, effects, terrains, or animations in the XNA Content Pipeline. You want to play digital media. Patterns are key to both iPhone and WP7 development, and fortunately, the Model-View-ViewModel (MVVM) pattern is very closely related to MVC (the evolution was from Model-View-Controller to Model-View-Presenter (Fowler) to Model-View-ViewModel). Again, I’ll devote an entire tutorial to this early in the series, but here’s a 1 minute overview. Do not let the User Interface (View) affect your Business objects and behaviors (View Model), which in turn is abstracted away from your data objects (Model) and of course your persistence mechanism. We tend to conceptualize the View (User Interface objects) at the top, the ViewModel (objects that provide the UI with its data and behaviors) in the middle and the model (often the persistence layer) at the bottom. The View can know about the ViewModel, the ViewModel about the Model, and the Model, like the cheese, stands alone. 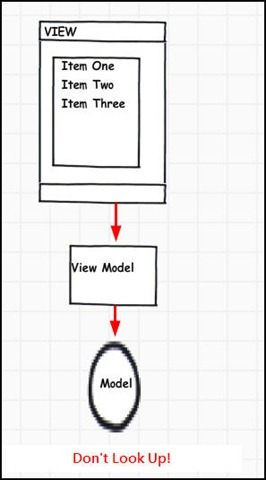 In MVVM the mechanism for the ViewModel to provide data to the View, is for the View to set the ViewModel as its DataContext. The details will follow in the tutorial on MVVM, but for now, take my word: this is wicked cool. Why’d Ya’ Call It ViewModel?? In addition to learning the frameworks, and becoming comfortable with Visual Studio (and perhaps Expression Blend), you will be making the jump from Objective C to C#. Like Britain and the United States, these are two frameworks separated by a common language, as C# and Objective C are, arguably, nearly as alike (and nearly as different!) as British English and American English. I will point out the key differences between the languages as they come up, and will devote an early tutorial to exploring the differences in depth, especially where the same word is used in different ways. Here is the nub. Is it worth it to put your application on both platforms? A better way to ask is this: is the additional revenue and satisfaction higher than the cost? A good way to make the answer to this a resounding “yes” is to architect for multi-platform development, and we’ll devote at least two tutorials to that topic. The short answer, of course is that by starting out with MVC/MVVM you are already much of the way there, as the “logic” and “data” of your two programs should be (nearly) identical. The series outline will be available on my blog site, updated frequently as the series evolves. In addition, the tutorials will point to material where you can find greater details, depth or source code. The i2W triplet will be used in all areas when there might be confusion for iPhone developers in Windows Phone 7 syntax or idiom . This entry was posted in iPhoneToWP7, Mini-Tutorial, WindowsPhone and tagged i2WTutorial, WindowsPhone, wp7Tutorial. Bookmark the permalink. Sorry, but as I understand the copyright rules in the US, phrases or words cannot be trademarked. The term “theminimumyouneedtoknow” is a commonly used phrase. For instance, I cannot trademark or copyright the phrase: “Pleasere-wordthispage”, it is a commonly used phrase. Pingback: iPhone Developers? How to move to Windows Phone 7 | I Love Windows Phone! How lame, some tech guy trying to copyright/trademark a phrase that has been used for 20 years and there is plenty of “Prior Art” out ther to dispute his claimed trademark.. We’ll have to make sure the trademark office knows that this isn’t cool.. Especially when you have a website like Jesse’s who doesn’t make money off of his site at all who is doing this as a free community resource. The link the person provided doesn’t even look professional (in my humble opinion), how uncredible..
seasoned_geek :Please re-word this page. Please re-word this page. “The Minimum You Need to Know” is a registered trademark of Logikal Solutions and you have not paid to use it. For more information visit http://www.theminimumyouneedtoknow.com. Looking forward for more infos too, this sounds very interesting. Thanks for this Jesse! This is a great series for beginner smart phone developer like your’s truly. Would it be possible to also show some tips & tricks across various performance & design considerations in these tutorials? Thanks for all the great work & article!